Firstly, thank you for expressing your interest in wanting to be part of all our future competitions! Before you make your application, please make sure to read and understand all the rules and information. We feel that the best way to improve your building skills is through a nice friendly competition. It allows you to get some constructive feedback about what you’ve done well and what you need to improve on. So, we hope you’ll give it a go! • Regular players can look, but they can’t touch – Meaning anyone can visit the competition world to look around; however, players must apply before they are able to build and enter competitions. 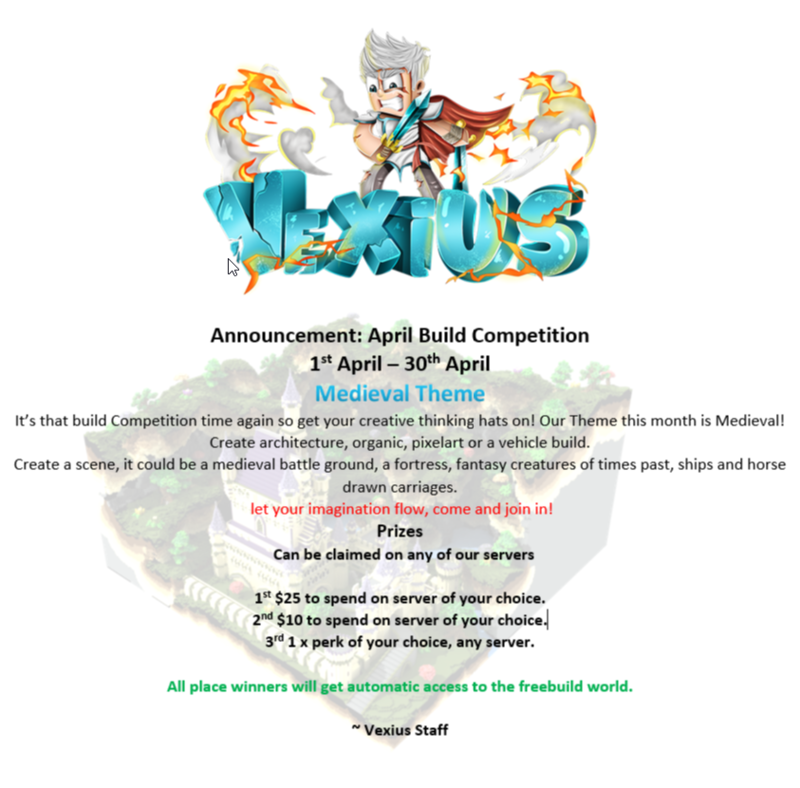 • Once you are accepted into the build world, you will be issued a plot from a staff member and you will be free to start building for the current competition. • Once plots have been judged and we have our winners, your plot will be locked and claimed by a staff member. You will then be assigned a new plot when the next competition begins. • If you don’t finish your plot then it will be removed, you will have the right to request a staff member to move it over to the regular plot world if you wish to finish it there. • Plots in the competition world will be bigger than the plots in the regular world. • You only must apply once, when you are accepted, you won’t have to reapply for future competitions. • Competitions will be announced on the discord and in this section of the forums, so keep an eye out! There are no requirements to apply for the competition world, you can be a brand-new player, or an ancient player. Everyone is welcome to join! In fact, the more the better! If you’ve read and understood the rules and information, then congratulations! You’re onto the application. Please don’t ask staff members about your application we will get to it as soon as we can! If you have any questions regarding the application, please don’t hesitate to get in contact with a staff member on discord or raise a ticket in game. We wish you all the best of luck on your application and we look forward to seeing you in future competitions!